Click the pic to see the new Shooting Sports flyer! When: Mondays, May 13th & 20th, June 3rd & 17th and July 1st & 8th, 2019 from 6:00-7:00 p.m.
All 4-H and community youth are welcome to come participate in this new archery program! 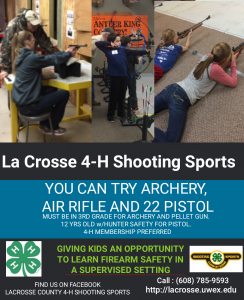 If you are unable to participate in the winter Archery & Pellet Gun Program (below), this is a great way to get your 2 sessions done in order to participate in the 2019 La Crosse Interstate Fair Archery Tournament. Or maybe you had so much fun this winter, you want to continue your archery studies this spring! Please contact the Extension La Crosse County office with questions at LaCrosseCounty4H@lacrossecounty.org or 608-785-9593. ***Participants do not have to participate in the winter Archery & Pellet Gun Program (below) in order to participate in the Holmen Archery Program. Registration is due by 4:30 p.m. to the Extension La Crosse County office on Thursday, May 2nd. The 4-H Archery & Pellet Gun program is typically held from January through March on alternating Saturday mornings. The overall focus of the program is the development of youth as individuals AND as productive, responsible citizens. This program is taught by caring, certified adults in a positive, safe learning environment. Safety will be emphasized and all youth will participate in a safety session at the start of the first session. Classes are typically held at La Crosse Archery (1231 Oak Forest Dr, Onalaska). Members must be in at least 3rd grade to sign up. Please note: you must be enrolled or re-enrolled in 4HOnline for the year in order to receive the 4-H member fee for this program! The 2019 Invitational is set for April 5th-6th, 2019 (participants only shoot 1 of the 2 days) at La Crosse Archery (1231 Oak Forest Drive, Onalaska, WI 54650). Participants do not have to be 4-H members, nor do they have to live in La Crosse County. 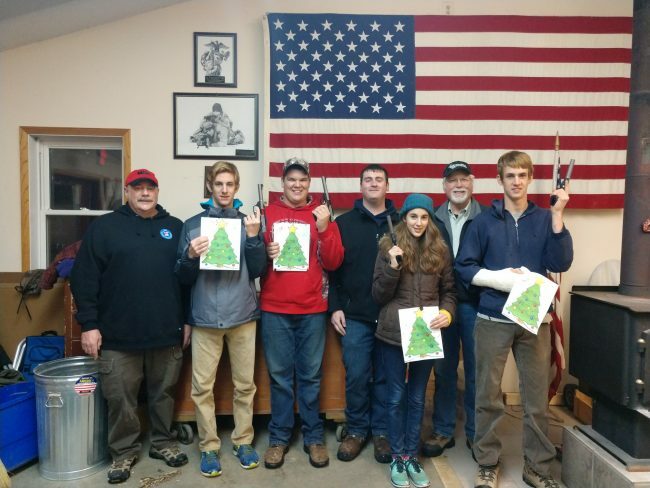 For youth that participated in the annual Archery & Pellet Gun Program in January through March, participation in this separate invitational is free. For all other participants, there is a $7 fee for the first event and an additional $5 fee for each even thereafter. Please contact the Extension La Crosse County office with questions at LaCrosseCounty4H@lacrossecounty.org or 608-785-9593. Registration is due by 4:30 p.m. on Thursday, March 28th. When: Tuesday, May 7th & Thursday, May 9th, 2019 from 6:00-8:30 p.m. The program will include safety instruction, insurance, ear protection, use of Committee’s Browning Buck Mark .22 caliber pistols, all ammunition, targets and use of facility. This will be the 7th time the Committee has offered this fun, safe and effective program! A team of committed and certified instructors will be present at all times to insure safe and quality instruction. Registration is filled on a first-come, first-serve basis with a class maximum of 12 (minimum of 4 to hold the program). Registration is due with fee and a copy of the Hunter’s Safety Certificate by 4:30 p.m. on Wednesday, May 1st to the Extension La Crosse County office. Please contact instructor Chuck Schleifer at chuckschleifer55@gmail.com with any questions. A September Pistol Shooting Program is scheduled for Tuesday, Sept. 17th & Thursday, Sept. 19th. Look for more details coming this summer! The event will include safety instruction, insurance, ear protection, use of Committee’s 4-H shotguns (or feel free to bring your own) (12 or 20 gauge), all ammunition and use of facility. A team of committed and certified instructors will be present at all times to insure safe and quality instruction. Registration is filled on a first-come, first-serve basis (class maximum of 20, no minimum). Registration is due with fee and copy of Hunter’s Safety Certificate by 4:30 p.m. on Wednesday, May 22nd to the Extension La Crosse County office. Please contact Chuck Schleifer at chuckschleifer55@gmail.com with any questions. Instructors/coaches will be present to make this a safe and fun experience for everyone. Parents will be welcome and encouraged to participate. As interest of our youth grows within this sport, a 4-H program could possibly be developed. Please contact Chuck Schleifer at chuckschleifer55@gmail.com with any questions.